This manual contains important safety information safety information and precautionary measures. Proper use of the equipment must be discussed with AOS Australia Pty Ltd. Operating personnel must be aware of and adhere to; the most stringent safety procedures must be followed. This manual is intended to be used as a work of reference for professional, well trained and authorised the user to be able to safely install, use and maintain and repair the product mentioned on the cover this document. Take your time to carefully read and understand this manual before using the product and always keep the manual with the product for future use. The AOS ESP unit must not be used in an explosive atmosphere. The AOS ESP unit must not be used to collect explosive emissions. The AOS ESP unit must not be used in high-temperature environments, no more than 50 degrees and must be approved for AOS. Only suitable qualified personnel are to work on the electrical systems. Protective clothing and safety gloves and glasses must be worn when working on the unit. Must comply and adhere to local and national safety codes. The AOS ESP unit is only required for pollution control and odour control systems only NOTE: Improper use may cause damage to equipment or injury to personnel. AOS Australia Pty Ltd will not accept liability for any damage resulting in improper use. 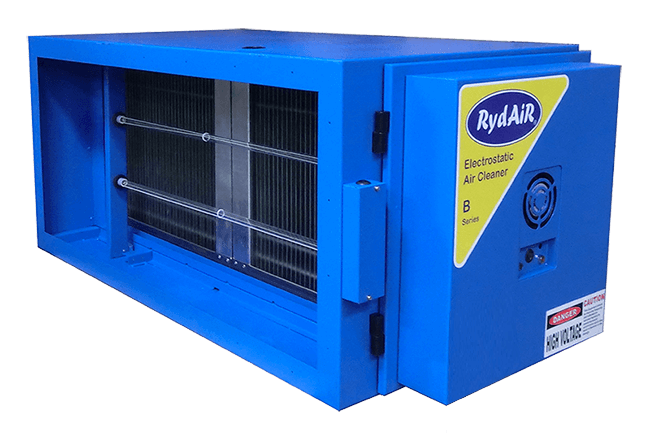 AOS Australia Pty Ltd cannot and will not hold responsible for the installation of the electrostatic air filter unit and duct design exhaust fan selection, ESP configuration, air velocity and overall system failure and maintenance procedures. The AOS ESP unit is only to be operated in a safe and serviceable condition. In the event of a defect of the AOS electrostatic precipitator unit must be shut down immediately faults must be rectified at once. Do not operate the AOS ESP unit with the kitchen exhaust fan on. The AOS air filtration system unit must be switched off when carrying out maintenance and service work in the kitchen ventilation system. How does the AOS Electrostatic Precipitator work?